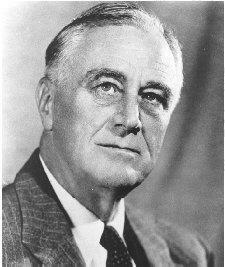 IT was the worst of times when Franklin Delano Roosevelt assumed the presidency in March 1933. Following the ruinous stock market crash of late 1929, the bottom seemed to drop out of the American economy. By 1933, securities listed on the New York Stock Exchange had lost more than three-quarters of their 1929 value. Industrial production had fallen to half its 1929 level. Agricultural income had plummeted even more sharply. Piles of unmarketable wheat flanked railroad tracks across the plains states. Desperate Iowa farmers blockaded the approaches to Sioux City in the summer of 1932, assaulting vehicles that tried to breach the makeshift barricades of logs and spiked telephone poles. Americans had earned some $88 billion in 1929. Those still lucky enough to be working earned less than half that amount four years later. One wage earner in four—some 13 million people—had no job in 1933. Some 5,000 banks collapsed in the first three years of the depression, carrying down with them the life savings of tens of thousands of citizens. Those cold statistics only hinted at the human suffering that the Great Depression inflicted. Anxious men and women postponed or canceled plans to marry. Struggling couples had fewer children. Even the divorce rate declined, as the contracting economy sealed the exits from unhappy marriages. Disillusioned immigrants forsook the fabled American land of promise and returned by the thousands to their old countries. Nearly 100,000 down-and-out Americans responded to an advertisement in 1931 offering employment in the Soviet Union. More than a million homeless hoboes drifted about the country in search of work. "Hoovervilles," tar-paper and cardboard shanty-towns derisively named for the incumbent president, sprang up on the outskirts of virtually every major city. One such encampment of the unemployed arose in the summer of 1932 on the damp flatlands along the Anacostia River, in the District of Columbia. Bivouacked in old pup tents and huts fashioned from packing cases, some fifteen thousand veterans of World War I sought by their presence in Washington to wring from Congress the early award of a war-service bonus scheduled to be paid in 1945. President Hoover responded by putting the White House under guard, chaining its gates, and mobilizing four troops of cavalry under the command of General Douglas MacArthur. Exceeding his orders to contain the "Bonus Expeditionary Force" in their campsite at Anacostia Flats, MacArthur cleared the area with tear gas and put the marchers' shacks to the torch. Against this background of deepening economic distress and rising social tension, Democrats met in Chicago in June 1932 to nominate their presidential candidate. Their party had not commanded the White House since Woodrow Wilson's departure in 1921. In the intervening years, the party had been riven by apparently irreconcilable conflicts between its stunningly disparate factions: agriculturalists opposed industrialists; the largely rural, Protestant, old-stock Anglo-Saxon South, still the party's principal power base, struggled to accommodate the growing influence of the Catholic American body politic. Their effort to coalesce, to agree on a candidate, and to govern thus tested the ability of the society itself to cope with the crisis of the depression in a coherent, effective way. James MacGregor Burns, Roosevelt: The Lion and the Fox (New York, 1956) and Roosevelt: The Soldier of Freedom (New York, 1970), comprise the most exhaustive biography of Roosevelt and deal with the New Deal and the war years, respectively. Two superb one-volume treatments of FDR are Frank Freidel, Franklin D. Roosevelt: A Rendezvous with Destiny (Boston, 1990), and Ted Morgan, FDR: A Biography (New York, 1985). Arthur M. Schlesinger, Jr., The Age of Roosevelt , 3 vols. (Boston, 1957–1960), a brilliantly partisan history, is rich in detail and anecdote, covering the period up to 1936. Frank B. Freidel, Franklin D. Roosevelt , 4 vols. (Boston, 1952–1973), is the most detailed of the Roosevelt studies, though these volumes take the story only as far as 1933. A massive, gripping examination of how FDR was changed by his illness is Geoffrey C. Ward, A First-Class Temperament: The Emergence of Franklin Roosevelt (New York, 1989). Betty H. Winfield, FDR and the News Media (Urbana, Ill., 1990), is the best of a number of books that have been written on its subject. Invaluable for details is Otis L. Graham, Jr., and Meghan Robinson Wander, Franklin D. Roosevelt, His Life and Times: An Encyclopedic View (Boston, 1985). Two contrasting recent interpretations are Philip Abbott, The Exemplary Presidency: Franklin D. Roosevelt and the American Political Tradition (Amherst, Mass., 1990), and Robert Shogan, Hard Bargain: How FDR Twisted Churchill's Arm, Evaded the Law, and Changed the Role of the American Presidency (New York, 1995). Anthony J. Badger, The New Deal: The Depression Years, 1933–40 (New York, 1989), gives an excellent account of Roosevelt's principal social and economic policies. William E. Leuchtenburg, Franklin D. Roosevelt and the New Deal, 1932–1940 (New York, 1963), is an eminently readable, engaging account of the Roosevelt years up to 1940. Leuchtenburg's The FDR Years: On Roosevelt and His Legacy (New York, 1995), is the mature summing-up of one of the preeminent students of FDR's career. Paul K. Conkin, The New Deal , rev. ed. (New York, 1975), is the best of the "revisionist" accounts criticizing the New Deal for being too timid, even conservative. Ellis W. Hawley, The New Deal and the Problem of Monopoly: A Study in Economic Ambivalence (Princeton, N.J., 1966), is the leading study of New Deal domestic economic policies. Alan Brinkley, Voices of Protest: Huey Long, Father Coughlin, and the Great Depression (New York, 1982), is a fresh, suggestive analysis of the two Depression-era figures who had a plausible chance, if anyone did, of wringing radical results from the crisis of the 1930s. The same author's The End of Reform: New Deal Liberalism in Recession and War (New York, 1995) examines the economic policy debates of the later Roosevelt years. Robert Dallek, Franklin D. Roosevelt and American Foreign Policy, 1932–1945 (New York, 1979), the only complete account of Roosevelt's foreign policies, is an unusually thorough and intelligent work. John Morton Blum, From the Morgenthau Diaries , 3 vols. (Boston, 1959–1967), a meticulous history of the Roosevelt years from the perspective of the Treasury Department, is particularly informative about foreign economic policy. Waldo Heinrichs, Threshold of War: Franklin D. Roosevelt and American Entry into World War II (New York, 1988), analyzes in detail the fateful year of 1941. A scintillating evocation of FDR's military leaders is Eric Larrabee, Commander in Chief: Franklin Delano Roosevelt, His Lieutenants, and Their War (New York, 1987). Warren F. Kimball, ed., Churchill and Roosevelt: The Complete Correspondence , 3 vols. (Princeton, N.J., 1984), is an indispensable source for the war years. John Morton Blum, V Was for Victory: Politics and American Culture During World War II (New York, 1976), is a comprehensive and somewhat disillusioned discussion of the home front during World War II. A mesmerizing estimate of the Franklin Roosevelts as a couple is Doris Kearns Goodwin, No Ordinary Time: Franklin and Eleanor Roosevelt; The Home Front in World War II (New York, 1994). It supplements Joseph P. Lash, Eleanor and Franklin: The Story of Their Relationship, Based On Eleanor Roosevelt's Private Papers (New York, 1971). Recent works include James MacGregor Burns and Susan Dunn, The Three Roosevelts: Patrician Leaders Who Transformed America (New York, 2001), which examines the roles of Theodore Roosevelt in inspiring his cousins Eleanor and Franklin to work for social and economic justice. Kenneth S. Davis, FDR: The War President, 1940–1943: A History (New York, 2000), the latest of the author's books on Roosevelt, is good on the role of Harry Hopkins. Thomas J. Fleming, The New Dealers' War: FDR and the War within World War II (New York, 2001), sharply challenges the traditional veneration of Roosevelt as a leader in World War II. Jonas Klein (introduction by George J. Mitchell), Beloved Island: Franklin and Eleanor and the Legacy of Campobello (Forest Dale, Vt., 2000), explores the role of the Roosevelts' summer home in shaping their private lives. See also Joseph E. Persico, Roosevelt's Secret War: FDR and World War II Espionage (New York, 2001), and David Reynolds, From Munich to Pearl Harbor: Roosevelt's America and the Origins of the Second World War (Chicago, 2001). Very useful. My entire project for school was done based on this information. thanks for the great pic! really looks good for my project! ill be sure to cite the page! great pic! using it on my decade project.awesome. Thanks! F.D.R had a disability; this man gave me the "strength" to carry on, just in knowing he could...There are often obstacles in life unless they are approached from a different viewpoint. Hoover, Herbert Truman, Harry S.